Every point in an AutoCAD drawing file can be identified by its X,Y,Z coordinates. (In most 2D drawings, the Z-coordinate value is 0.0.) This system of coordinates is referred to in AutoCAD as the world coordinate system, or WCS. Relative X,Y coordinates in the form @X,Y (for example, @3,2): Defines a new point that is X units horizontally and Y units vertically away from the current point. Relative polar coordinates in the form @distance<angle (for example, @6<45): Defines a new point that is the specified distance units away from the current point at the specified angle from the origin. Many times, you can conveniently define an additional coordinate system to more easily create drawings. This non–world coordinate system, known as a user coordinate system, is so widely used that UCS now refers to every coordinate system in AutoCAD. Why would you want to diverge from the standard WCS? Well, the most common reason is that it’s much easier to calculate and enter coordinates if they’re based on the plane you want to work on in 3D. Suppose that you’re modeling an old-fashioned, wedge-shaped rubber doorstop and you want to add the manufacturer’s logo to the sloping surface of the wedge. It isn’t easy if you stay in the WCS, but AutoCAD lets you set a new UCS based on that sloping surface. After the UCS is made current, you draw in it just as you draw in the WCS. Although originally intended for 3D work, a UCS can be useful on either two dimensions or three. The WCS assumes that the north direction is straight up, but you may be working on a building layout where one wing is at a 37.8 degree angle to the other. No problem: Simply create a UCS that’s aligned appropriately. You can look up this process in the online help system, but here’s a quick hint: Click the UCS icon in the lower-left corner of the screen to make “grips” appear at the origin and the ends of the axis indicators. Then drag the icon by its grips to set a new UCS. 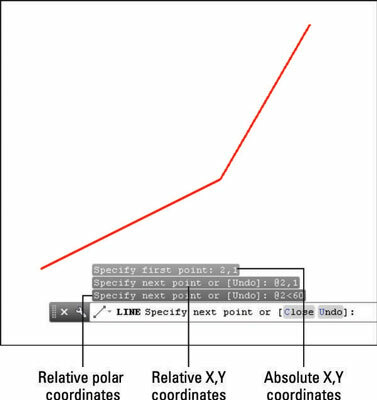 AutoCAD locates absolute X,Y coordinates with respect to the 0,0 point of the drawing — usually, its lower-left corner. AutoCAD locates relative X,Y coordinates and relative polar coordinates with respect to the previous point you picked or typed. You will see how AutoCAD uses all three coordinate formats to draw a pair of line segments that start at the absolute coordinates 2,1, and then move to the right 2 units and up 1 unit (@2,1) relative to the first point, and then (relative to that point) move 2 units at an angle of 60 degrees (@2<60). Note in particular how the first two coordinate pairs use the same numbers (2,1) but the second pair defines a different point because of the leading @ symbol. You can find out the X,Y location of the crosshairs by moving them around in the drawing area and reading the coordinate values at the left end of the status bar. The X,Y coordinates should change as you move the crosshairs. If the coordinates don’t change, click the drawing coordinates area until you see Coords on in the command line. If you’re using the full version of AutoCAD, you may have noticed that three numbers are at the left end of the status bar. AutoCAD is showing you the X,Y coordinates of the crosshairs and the current elevation. However, in 2D drafting, the Z value is 0, so you can continue calling them X,Y coordinates. Off (<Coords off>): The status bar coordinate readout is dimmed, and the coordinate values don’t update until you pick a point. On, showing X,Y coordinates (<Coords on>): The coordinate readout appears black, and the absolute X,Y coordinates update continuously as you move the crosshairs. If no command is active, clicking the coordinates readout alternates between this mode and <Coords off>. On, showing polar coordinates (<Coords on>): This mode, which displays distance and angle relative to the last point picked rather than absolute X,Y values, appears if a command is active and AutoCAD is waiting for you to pick a point. On, showing geographic coordinates (<Coords on>): This mode displays coordinates as latitude and longitude values, but it can be used only after you set the drawing’s geographic location with the GeographicLocation command. If you start a command such as Line, pick a point, and then click the Coordinates area a few times, the display changes from coordinates Off to live absolute coordinates to live polar coordinates. Displaying live polar coordinates is the most informative mode most of the time. 6′-6″ is 6 feet, 6 inches. 6′6″ and 6′6 are the same as 6′-6″. 6′6-1/2 (or 6′-6-1/2) represents 6 feet, 6-1/2 inches. 6′6.5 is the same as 6′6-1/2″ to AutoCAD, whether you’re working in architectural or engineering units.